Bird watchers have come to expect nearly endless variations of a small number of familiar forms throughout the world’s 10,000 species. For example, there are over 400 species of warblers worldwide, even though the differences between some of these species seem superficial at best. Still, the prolific diversity of avian archetypes spoils us sometimes. There’s always a new species of eagle or sparrow around the corner to discover. Amazing as it sounds, there are only 7 species of swan in the world. Obviously, they make a great impression, adored as they are throughout the world as the epitome of grace, the symbol of effortless beauty. 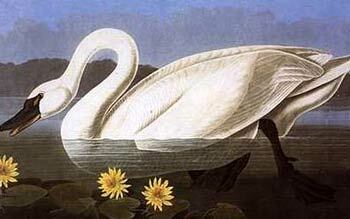 But there are only 7 species, and only 2 indigenous to North America (remember, the Mute Swan is an invasive species.) The Tundra Swan, Cygnus columbianus, is one of these North American natives, with a population of roughly 200,000. This elegant waterfowl, formerly known as the Whistling Swan and referred to by Audubon himself as the Common American Swan, nests in the tundra or marshes on the Alaskan and Canadian coast near the Arctic Circle. The eastern population of tundra swans, of which there are maybe 110,000, spends winter in flocks along the East Coast near the Chesapeake Bay and in the marshes of Virginia and North Carolina. The western population of swans, smaller than the eastern group, uses the western flyway from the Arctic to California’s San Joaquin and Sacramento Valleys. So, out of 10,000 bird species, there are but 7 swans, only 2 of which are native to North America. There is a population of 110,000 that lives far to the north but winters in the mid-Atlantic. The eastern population does not migrate through the northeastern U.S., but travels through the Canadian boreal forest to the northern prairies, then to the Great Lakes on to Chesapeake Bay. No part of New York State is on the tundra swan flight path, certainly not the Hudson Valley. This, then, is why we were all so excited to see the tundra swan this past Saturday at Croton Point. Now that you know how rare this sighting is, aren’t you impressed?